Fourteen percent of households are classified as “food insecure.” That has to change. For such a wealthy nation, hunger is shockingly widespread in the United States. Food insecurity has risen about a third since the recession, to 14 percent of households nationwide. So why is it so hard for the world’s richest economy to provide poor people with enough money to feed themselves? Now we have some numbers to help explain to lawmakers what to the rest of us has become painfully obvious. It starts with a number we’ve been hearing a lot lately: $15. The movement for $15 an hour and union rights has transformed the conversation on inequality this election season. And it forms the basis of a new analysis that reveals one answer to the crisis of food insecurity. According to The Century Foundation, bringing the nationwide hourly base wage to $15 by 2023 would free 1.2 million households from hunger. The households who would achieve food security—the ability to consistently meet basic nutritional needs—mirror the demographics of the low-wage workforce as a whole: about 44 percent, or half a million, would be black and Latino households. Nearly 350,000 would be single-parent households, who suffer disproportionately from hunger. The wage hike—a measure already enacted in several states and cities—would yield long-term benefits that can’t be directly calculated. Food insecurity and low wages often go together, trapping families in unstable low-paying jobs with little opportunity for advancement, while also dealing with the chaos of navigating the public benefits system or food pantries to secure basic food supplies. The compounding effects of low wages and social deficits, plus other financial burdens like housing and utilities that often get sacrificed when food is scarce, force families into a state of constant distress, making it even harder to hold down a steady job. The analysis presents one straightforward way to improve people’s economic well being in the absence of major changes to social safety-net programs. According to William Rodgers III, author of the report, “modest increases in the minimum wage…will lead to parents being healthier, and hence more productive in the workplace.” And when the rest of the family has adequate nutrition, a single mom maybe has some extra juice left over at the end of the day to, say, read to her kids, or plan finances for college. In the long run, Rodgers adds, “healthier kids today means they can learn and study better, and achieve higher levels in school, and thus when they proceed to the workplace, they’ll even be more productive.” So the raise could become an investment in a more productive workforce, which is crucial in an era of heightened economic volatility. 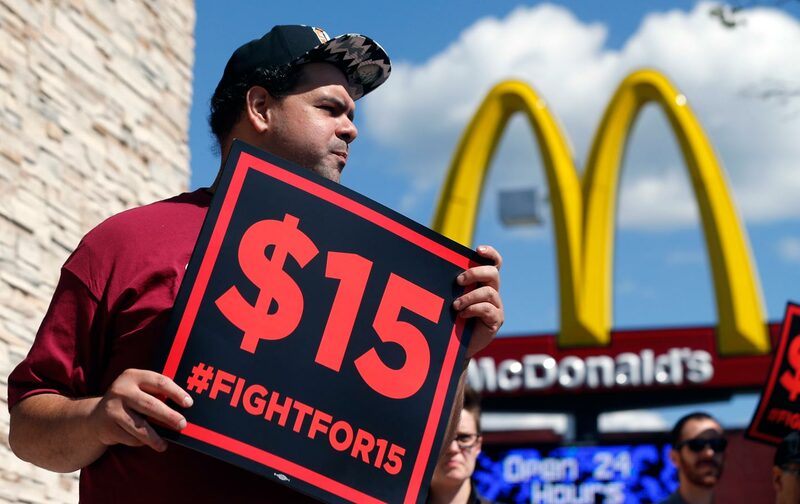 The findings show more than just a linear equation of higher wages-equals-more food; raising wages is a direct intervention against what Rodgers projects is an impending “third surge in income inequality.” The coming crisis is fueled by slumping productivity and systemic social disinvestment in “human priorities,” such as nutrition and housing, over the past several years. One key finding is that the wage hike’s greatest projected impact is in lifting up the slightly better-off side of the food-insecure populace: More than half of the affected families are not the ultra-destitute but generally lower-income, earning over 185 percent of the poverty line (about $37,000 for a typical three-person household). So $15 per hour for a working-poor single mom, for example, would mean the difference between having to go to a pantry for some meals to being finally able to afford groceries month-to-month. Higher wages also foster long-term self-sufficiency by offsetting dependence on social supports. Food-stamp eligibility rules are often so rigid, a worker’s benefits might be cut in response to even a modest increase in income, and poor workers end up staying hungry even if they are working more. A really significant rise, say from the current $7.25 federal minimum wage to $15 an hour, would ensure that paid work becomes a more rational option for making ends meet. The data counters the common argument against raising the minimum wage: that it would harm more than help the poor by disrupting business and “killing jobs.” But the long-term projections show the minimum-wage increase would improve families’ material well-being while promoting broader social benefits. And the impact is widely distributed, with major gains in food security in both higher and lower-income regions (including several Southern and Midwestern states with low state minimum wages that are traditional strongholds of fiscal conservatives). Better-paying jobs could also affect food consumption in more holistic ways. One of the ironies of the current hunger-afflicted population is that many starving people work in the food industries, including restaurant staffers and farm workers. Some preliminary data analysis, Rodgers says, shows that a higher minimum wage correlates with lower fast-food expenditures. So maybe lifting wages could gradually turn working-class neighborhoods away from Big Macs as a source of either food or jobs, and lead to local food systems with more green grocers and home-cooked meals. Still, raising the minimum wage won’t fix an irrational welfare infrastructure. Whatever the minimum wage, many will still suffer from long-term joblessness and require sustained social supports. And even at $15 an hour, workers won’t be able to afford decent housing or lift themselves out of near-poverty in many cities with a high cost of living, like New York. An economy structured on institutionalized inequality afflicts workers at every income level, and a lack of living-wage jobs and fair working conditions leaves all of us starved for equity. Reducing hunger for the most marginalized families is the least that policymakers can do. The common-sense notion of simply paying people more, so that they don’t go hungry, is “not rocket science,” Rodgers acknowledges. But at least now we have concrete evidence to show what working families intuitively know about the real value of a $15 wage: Every hour’s worth of decent work literally enables a family to survive from one day to the next.